A new visitor to the inner berth at Hunterston was seen not long after arrival. 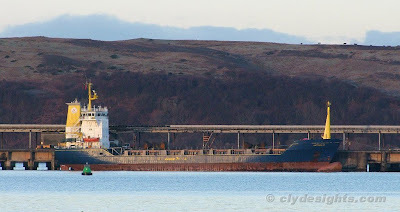 The 4,646 tonne deadweight coaster ANTONIA B, a vessel that dates from 1983, had arrived from her previous charter via Roitterdam, to commence a period of service carrying coal from Hunterston to Kilroot on Belfast Lough. Operated by GBS-Shipmanagement GmbH, like many ships of her age she has carried a multitude of names, most recently having been named CLONTARF until 2008. A product of the Sietas shipyard in Germany, she is 97 metres long and previously served as a container ship, although her hull is suitably strengthened for the use of coal grabs like those used to load and discharge bulk cargoes.